Power Track does not follow the Traditional Learning Approach in which interaction is rarely mandatory, and classroom participants often sit passively, failing to maximize their class-room involvement. Alternatively, it tailors its programs to suit your needs, and conducts training in the form of customized workshops. Power Track professionals work jointly with clients before conducting a training to figure out the most appropriate customization that suits their needs. Power Track follows a unique way of providing after-course support, which is a distin-guished aspect in our business. 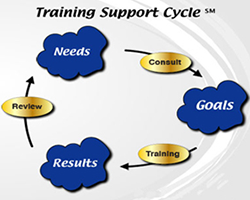 Instead of providing a theoretical support from the training de-partment, Power Track provides support from its support department whose staff hold years of direct experience in this field. We monitor trainees’ progress through following up with their performance.